Dmitry on the ASP.NET Team posted an awesome RSS Toolkit for ASP.NET 2.0 on his blog earlier tonight. It provides a ton of great support for both consuming and exposing RSS from ASP.NET 2.0 applications, and ships with full source code. March 26th, 2006 Update: Dmitry just updated the origional download here. As you can see above, the DataList is now bound to the data returned from the remote RSS feed on my site. What is really cool is that the RSSDataSource control will cache the RSS data to avoid hitting it remotely on each request – so that you can efficiently add this type of blog aggregation functionality to your site and not have to worry about your performance slowing down. This will then automatically generate and build a RSS channel proxy into your project for you to use (no command line tool usage required). This will then create a strongly typed object-model for the RSS schema, as well as build a default RSSHandlerBaseClass for you to use to publish it within an ASP.NET .ashx handler file. Note that all operations within the RSS handler are strongly typed (meaning you’ll get intellisense support, and a compile error if you mistype something). Note above how the channel item paths are fully qualified in the output RSS XML, but are using the “~” syntax in the .ashx handler. The RSS toolkit adds a nice feature which is the ability for a developer to use the “~” syntax to automatically fix up fully qualified path statements from the channel handler (that way the paths will be correct regardless of whatever server or virtual directory hierarchy the application is deployed on). One of the tricks people are doing these days with RSS is to enable people to subscribe to feeds that are personalized for them. They often do this by adding a query-string parameter to the RSS feed that contains a unique identifier to map the URL to a specific account name on the server (allowing a user for example to publish and subscribe to their private calendar or task-list or contact-list information). 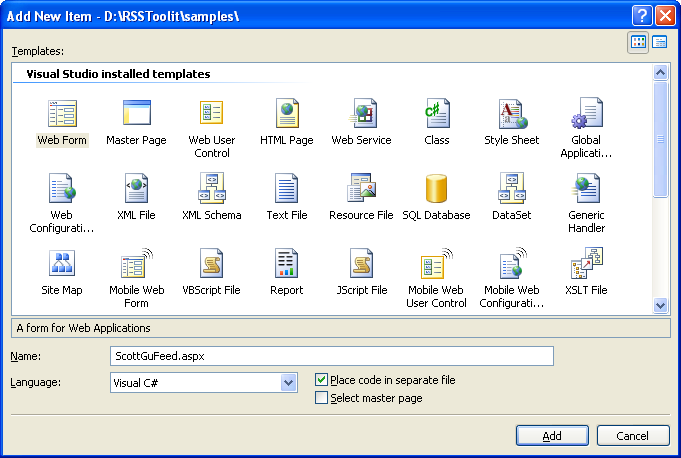 The RSS Toolkit allows you to easily build these types of apps and integrate them with the ASP.NET membership and authentication system. Note how in the handler above there is a “username” parameter to the PopulateChannel method. ASP.NET will look for an encrypted username value on the incoming RSS feed URL, and automatically decrypt and pass the username to this method when it is supplied (you could then write code within this method to hit a database and pull back only the items for that particular user). When a user clicks on this feed it will include their username encrypted within the URL. When they copy/paste the feed link into a blog reader (for example: to subscribe to it), it will then remember the user’s identity and allow them to always have a personalized view of the data. The RSS Toolkit automatically includes built-in caching logic so that RSS feed data is cached locally instead of fetched each time it is accessed/used. The RSS Toolkit supports caching this information both in-memory, as well as persistently to disk (for example: to survive worker process restarts or application resets). The benefit of this built-in caching integration is that you can efficiently subscribe and pull RSS data from a variety of remote sources without having to worry about your server blocking on remote network calls all the time. Note that the RSS toolkit by default uses an RSS channel’s TTL setting to control the cache duration semantics for you. The new ASP.NET RSS Toolkit provides a ton of cool RSS functionality to take advantage of, and allows you to easily integrate RSS within both your sites and applications. RSS is no longer just about blogging – it is now a super common data format for people to publish and subscribe to lots of different types of information (for example: check out this sample I built using the December CTP build of Atlas for a sample “Ajax Task List App” that publishes to-do items using RSS). You can download the RSS Toolkit from here. Best of all it is free, and all of the Toolkit’s source code is included with the sample. It includes a number of great scenario samples that you can walkthrough to quickly learn how to use it. The RSS Toolkit has been written to work in medium trust security scenarios – so you can run it on shared hosting servers (note: to consume remote RSS feeds the hosted server will need to allow remote out-bound http requests). Click here to learn more about how to find a hoster that provide inexpensive ASP.NET 2.0 and SQL hosting. P.S. In case you missed it in December, Dmitry also built and published a great disk-based output caching module for ASP.NET 2.0 as well. You can download it here. Super! Thanks for sharing this. Thanks for info.But I don't get it,why you need something more complicated than XmlDataSource+simple xsl?You can achieve similar results you present here but more easily IMHO. This is a nice solution. I just hope that the sourcecode is available for VB.NET also. Your last two solutions (1) Table Provider and (2) Online WAT solution were both important for us and unfortunately both were in C# only. This just disappoints us, as we cannot use this two great solutions as on date without VB.Net support. Pl. make sure to make sourcecode available in both the languages. Hope you understand our problems mr. scott. 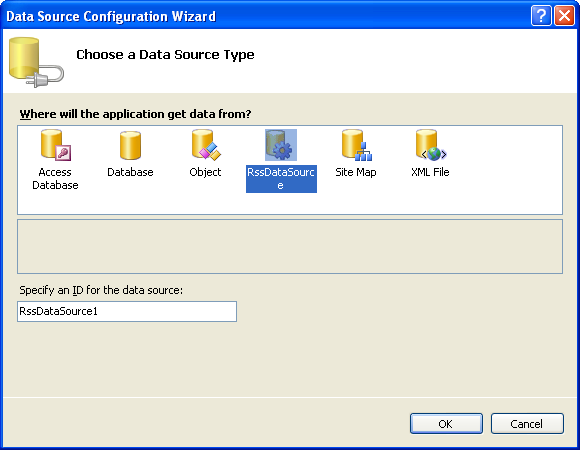 I believe if you have any control that derives from the DataSource control base class in your VS toolbox, it will show up as an option in the Data Source Wizard (we did this work to enable cool datasource controls like the RSS one to be built after the product shipped). Note that the full shource code for the RSSDataSource control is included in the download above -- so you can see exactly how it is built there. 1) It includes built-in caching of the RSS data, and can use the RSS feed's TTL (time to live) value to automatically cache the RSS data for you. This enables much more scalable solutions. 2) It is easier to use than XMLDataSource for RSS -- and avoids you having to write any custom transforms or databinding expressions to format the results. 3) It is a useful sample of how to build a DataSourceControl. We are going to be increasing the documentation on DataSourceControl's in the future (several people have asked for this). Samples like this also hopefully help. This new Toolkit is awesome. Now I don't have to worry about writing one from scratch it will save so much time now. RSS is no longer going to be a problem like it was. 1)Caching is not so difficult to implement using existent Application.Cache infrastructure-simply insert intermediate code between XMlDataSource control and feed source that will be doing caching before hand off xml to DS. &lt;XmlDataSource src=&quot;feed&quot; Transform=&quot;&quot;/&gt; looks nice to me+universal,I must add! 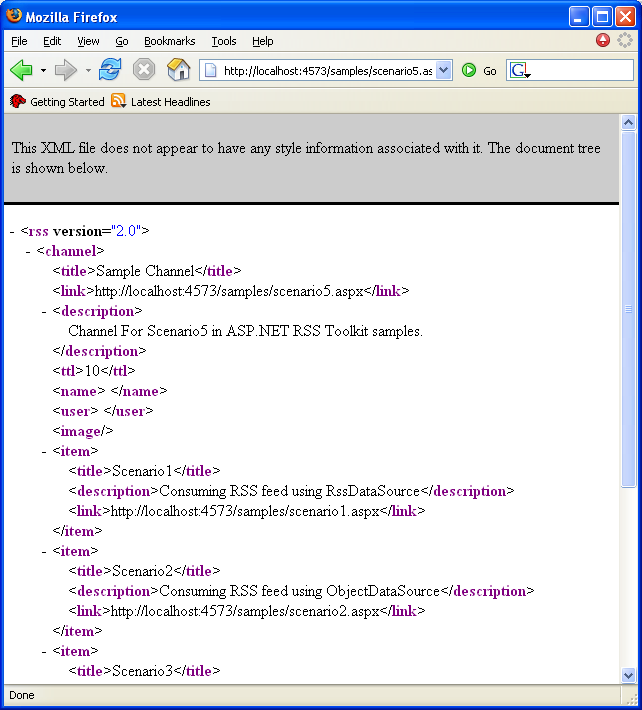 ;-)At last,if you need custom formatting modifying xsl is much more flexible and generic approach IMO. But there's two ways to &quot;web enable&quot; custom data model-custom providers(for existent datasource-I mean custom XmlReader/IXPathNavigable,for example) and custom DataSources.What approach you take is up to you of course,but it's not so obvious to me that DataSource is preferable in this case. I have'nt downloaded it yet, but its posted by you Scott, so it has to be awesome :)) (also i will thank to Dmitry on his blog personally). Beleive me you are day by day becoming my inspiration for so many things. Second, a while ago you made two great blog posts about a Data Tutorial scenarios in which you said there would be comming more of the same in the future. Have I missed a reference to them somewhere or are they still comming in the future? Or has the blog thread been discontinued? The data tutorials are still coming -- I've been fairly busy the last month which is part of the reason for the slow-down on them. I hope to have another one published, though, in the next week or so. Excellent article. Thanks for the screenshots and great detail. more tutorials on how to use this control will be great!! Am looking into learning more RSS Data Feeds and possible use of them on our sites (currently ASP Classic, but moving to ASP .NET) and was wondering if there was a way to use a parameter much like username is used in the above example to give specific content to the feeds. Let's say a State value, so a user can alsways get latest information about a certain State. I believe you want do that (Dmitry would be the expert -- you might want to ask him on his blog). The RSS toolkit also supports authentication -- so you can also vary feeds by authenticated user. Thanks for the great info on the RSS Toolkit Scott. I tried going through in a step-by-step manner, but When I choose a RSS datasource in step 3, the step 4 popup box for the RSS source does not show up. The datasource is created in the page, but it says "Error Creating Control". When I look in the source, the RSSDataSource shows an error "Element 'RssDataSource' is not a known element..." Did I miss something? I'm wondering whether the control wasn't properly installed for some reason. Can you post this question to Dmitry over on his blog? http://blogs.msdn.com/dmitryr -- he should be able to help. This is really interesting, but while reading it, the thought occurs to me that if you create a strongly typed class for a specific RSS feed, and then the publisher decideds to update the feed to include some fancy new feature, doesn't it break the app? Wouldn't this be a case where strong typing is not a good idea? I believe the way Dmitry implements the handler above it only parses on demand, and fails gracefully. That way if the schema for a property you aren't using changes, you should be fine. Of course, if you depend on a particular property element that is no longer there, you'll have problems regardless of whether it is strongly typed or late bound. This is awesome, now I am free from third party vendors. March 26th, 2006 Update: Dmitry just updated the (origional) original download here. I get this error: DataBinding: 'RssToolkit.RssElementCustomTypeDescriptor' does not allow indexed access. 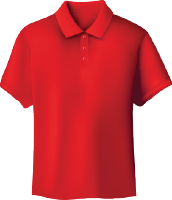 Can you send me a sample .zip file over email to look at? I had the same problem. I then removed the fields that are related to the comments (commentslabel...) and then it worked. I guess that the original entries have proper indices but the comments don't. I need to have 2 versions of a RSS file for two different cultures. '~/News.ashx?Culture=pt-PT' is not a valid virtual path. My objective was to have the culture info in my ashx file so I could generate the right RSS file from a database. Can you try removing the "~" from the URL? I'm wondering if that is causing the problem. "to consume remote RSS feeds the hosted server will need to allow remote out-bound http requests"
can you tell me how to enable this on the server? 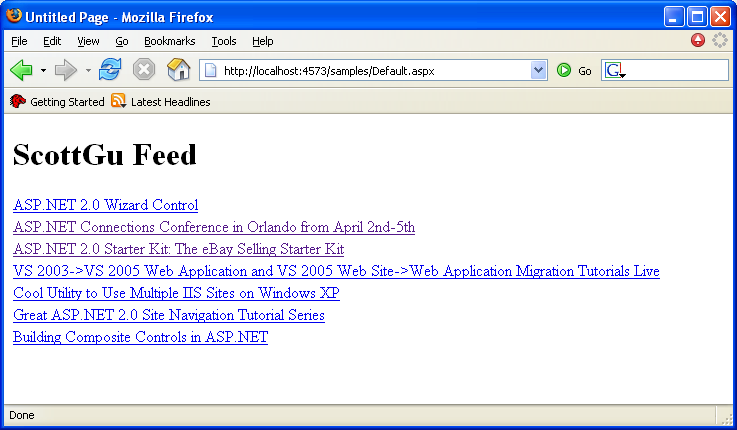 I'm using IIS 5.x. You'll need to make sure that the proxy configuration for the web-server is setup correctly if you are within an Intranet environment. Our server does not use Proxy. How will this be different? What is the error you are seeing? "The Remote Server returned an error. (401) Unauthorized"
"The RSS Channel is not valid..."
However, if I used a reader that allows for secured login (for example, allows the user to enter LAN ID and password, then it works. I sometimes get a "No Links found" message. So, basically, allow only authenticated users to the intranet, but let everyone else access the "rssfeeds" directory. I was wondering if anyone had any success with adding additional namespaces when publishing a feed? I tried modifying app_code/Sample5.rss with a new namespace declaration and the new prefixed rss elements, but when i viewed the feed using Scenario5.ashx the declaration and prefixes disppeared. The new rss elements showed up, but without the prefix. The declaration was completed removed from the tag. Any advice on how to implement would be greatly appreciated. He wrote the RSS toolkit and would be happy to help I'm sure. I want to ask my problem which was i faced using Rss toolkit. I want to publish my articles which are come from database according to category . I generate .ashx file also , but i am unable to use that .ashx file. Can you send me email (scottgu@microsoft.com) with more details of the issue? I will then loop you in with Dmitry who wrote the RSS Toolkit. Excellent tool - made my external news section cake! This code is great. Has been a huge help. I have just what i want running locally. Then I upload the site to a Godaddy hosted site and everything times out. Is this a proxy issue? I'm going to get any help from Godaddy. Is there another hosting provider someone could recommend? Hi Scott, your blog is awesome. It saved my life last month when I was working with some membership api stuff, and your reply to my post then was very helpful. I'm in the early stages of developing an aggregator for our users. We could have hundreds of user, each with 10s or 100s of feeds. Would Dmitryr's tool scale for something like this? It doesn't make sense to use the rssdl.exe for generating the classes and I'm not sure if it makes sense to somehow dynamically add all those feeds to the app_code directory either. I think that leaves using the RSSDataSource. Should I create a datasource for each feed a user may have? 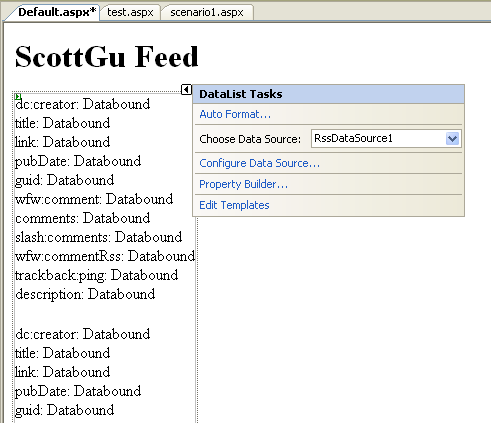 Or iterate the list of feeds, assigning each one in turn to the datasource? Again, thanks for a great and very useful blog. Very interesting question. For this scenario I'd probably recommend storing the feed information directly within a database, and use that to be able to construct a unique set of feeds out of all the ones registered. I'd then have a background process (implemented as a console application) on the server wake up periodically and check the feeds one after another for updates. Any updates would be persisted into the database - which the web application could then display back to the users. I think this type of model would scale very well. It could be a proxy issue. Can you check with GoDaddy to see whether they allow remote network connections from their servers? If they do, they might have a proxy setting for you to set in your web.config file. Are we still stuck on this index bug? Which index bug are you referring to?